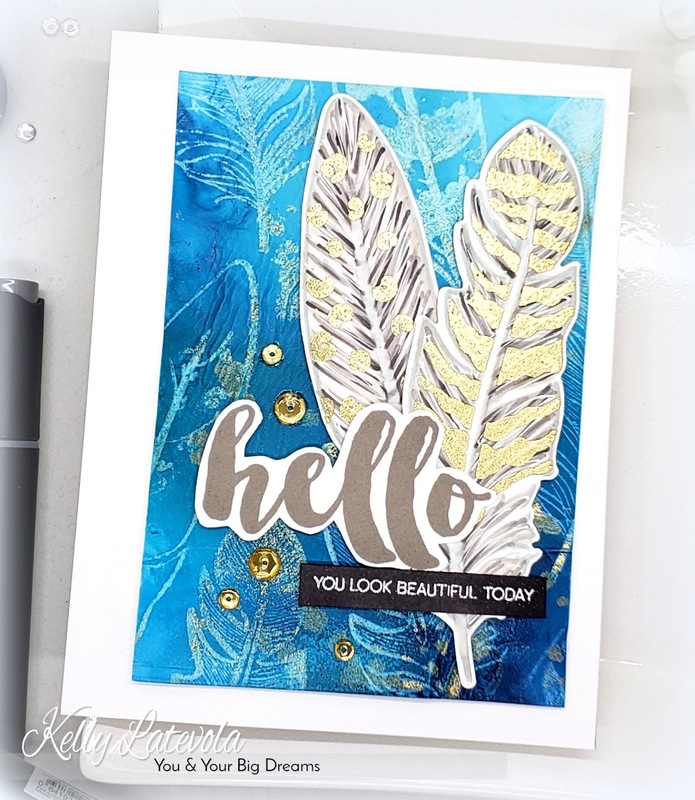 Welcome to the Altenew Refresh Your Alcohol Markers Blog Hop! blog. If you're just stopping by you can start at the beginning with the Altenew Card Blog. So what are we hopping for?! If you own the Altenew Artist Markers you're as excited about this as I am. Altenew has released refills for their entire line of artist markers. Speaking of Artist Markers there's a sale!!! 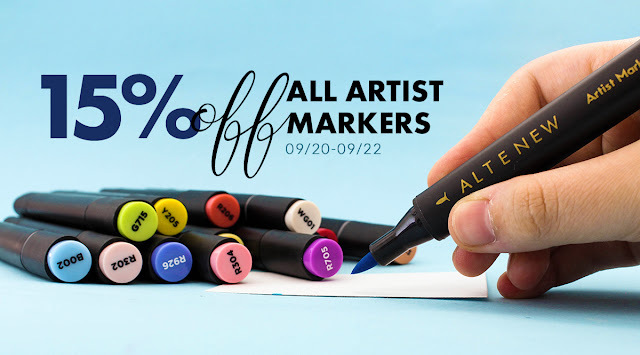 Altenew is offering 15% off all Artist Markers. The sale is good today through 09/22/2018. I used my artist markers but I also used the refills a little bit differently. Experimenting is fun even when it goes weird. I assure you mine definitely did. I started with Yupo paper and some regular rubbing alcohol. I dropped some alcohol onto the Yupo paper and then added a few different shades of blue. It didn't move a ton so I helped it along with a straw. Once it was dry and it took a hot minute. Probably because I was creating make shift alcohol inks and alcohol blending solution. But hey, nothing ventured, nothing gained. I used the new Tim Holtz Alcohol Lift- Ink to stamp a few feathers in the background. Make sure you clean the stamp after each lift. There really is ink lifted up onto your stamp. I stamped down two more feathers on white cardstock with a gray ink. I then used the warm gray markers from Artist set B to color them in with a feather texture. I used the layer stamps included in the set to gold emboss some detail on top of each feather before die cutting them out. I used a similar warm gray ink to stamp my hello which I trimmed out by hand. The tiny banner I created by coloring white cardstock with the dark gray artist marker. Talk about a perfect match! a few gold sequins finished it off. This entire thing went so bad. Typing it out will not do it justice. I promise I'll have the video up. It's to bizarre not to share lol. Check out the video below. Get a beverage first. It's a long one! Your Next stop on the hop is the Altenew Scrapbook Blog! In case you get lost along the way here is the list of the entire hop. Kelly girl, it doesn't look to me like everything went terribly wrong. If it did, then I need to have things go terribly wrong for me when I'm papercrafting bc your card is GORGEOUS!!! Will be looking for your video--chin up buttercup! Pretty feathers. Love the background. How did we ever get along without yupo? I love your gorgeous card Kelly! I don't see where anything went wrong, it looks like it all went right!! And the gold embossing on the feathers is gorgeous! Thanks for the great inspiration! Loving this card! Perhaps it didn't go as planned, but the result is amazing. Can't wait to see the video! It turned out so well. Thanks for sharing. Looking forward to the video and finding out what exactly went wrong, because I can see nothing wrong with your wonderful card. wonderful card, Kelly - look forward to seeing your video as I always love to listen to and watch you create! Wow! Your background is FABULOUS! Awesome design! Looking forward to watch your video, now I am intrigued 😉 Thanks for the inspiration Kelly! That background is just stunning!!!! If this is a everything went wrong I would love to know how to do it as I love this gorgeous card. 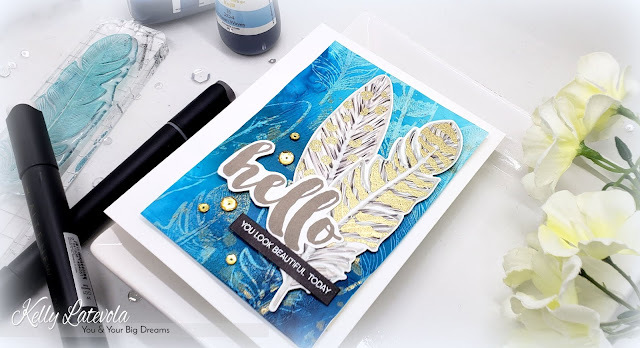 I love the background colors, I love feathers, and I love gold embossing so yep I love your card. I can't wait to see your video on what went wrong, this should be interesting oops I mean a learning experience LOL. Thanks for sharing and the inspiration. Gorgeous background, the feathers are awesome. The embossing is beautiful!! Great card as always! Can't wait for the video and your commintations. Love the color saturated background! The texture on your background is SO beautiful! The feathers are a nice touch to pull it all together. I can't imagine what went wrong, definitely interested in watching the video! I can't wait to watch the video because I can't see what did go so bad. I thing the card is great and I love your background. A beautiful card, Kelly! Whatever went wrong turned out to be wonderfully right in my opinion. As everyone else has said, can't wait to see the video!! Gorgeous card! Super cool background. Fantastic! I'm eagerly awaiting the video, because I can't see weirdness in your creation. Beautiful card! Love the technique and colors you used! Experimenting is always fun! One of a kinda are great. Hi Kelly, your card is perfect! I can't wait to see your video tonight. It sounds like a "hoot"! Very pretty feathers and I love the background. Your card is fantastic ! I'll be very happy to see the video, yours are always very inspiring. beautiful background!! love the card! You said everything went wrong, but your card is great! I don't see a thing wrong with this gorgeous card, Kelly! I love it!! Absolutely beautiful background!! Beautiful! Love the technique of lifting ink off! Love the lifting! Simply gorgeous! This is just simply lovely! I think your pretty feathery card is gorgeous! No one would think for a second that anything went weird. Love this card and the pretty color combination too! These feathers are awesome. Beautiful beautiful card. I highly recommend investing in some Dixie cups. Trap the spiders. Sometimes for the freakishly large ones, you may want to put something heavy over it. Or tape it down. THEN you have time to call someone to kill them without worrying about losing them. I always love your videos. It’s nice to know I’m not the only one that has trouble making a masterpiece! Kelly hun, I love you & your videos, but man alive when you have a disaster you really have one ! You have so so much more talent in your tiny tie than I have but how you stuck with this I will never know but admire deeply. But I do honestly think that in the end you turned it around & have a gorgeous card, the colour is pretty & has a nice texture, the gold shimmers & it has a very empowering sentiment on. Hugs from the heart ❤. Kelly I saw your video now and yes I saw where it went wrong. I think it's because the Yuppo paper is having a synthetic surface that your papers worped ( is that a correct word in English, I am Dutch so forgive me if it's wrong). But after putting the feathers on and finishing up that card looked great! So thank you and I'm curious about the continuation of your story. Kelly it is so fun working with Yupo paper even when it goes wonky. I have cut mine up and used it many other ways. I just think it is such a blast. Each is a super surprise. Love your card and I don't own these artists markers but the results are very good. Now you have me thinking. Nicely done. Wow, this is a stunning card! Love that blue background with the gold feathers. The sequins are the perfect touch! 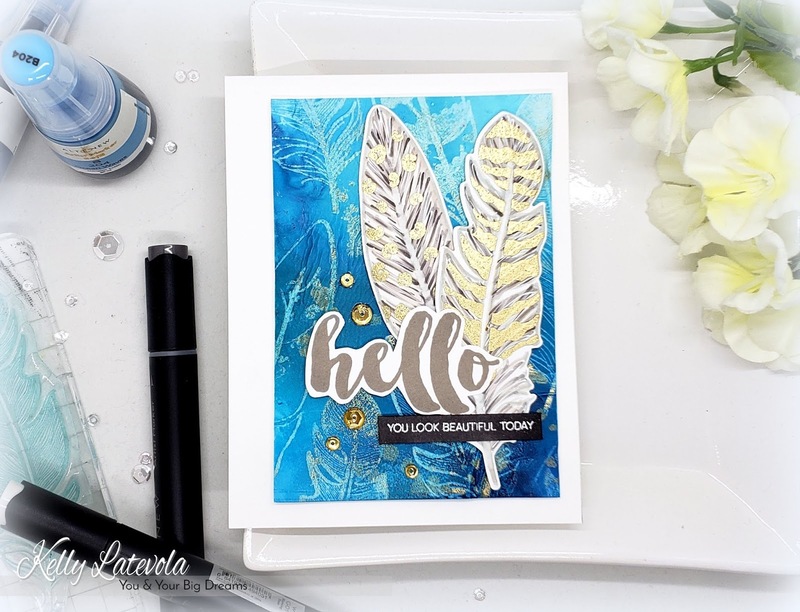 Lovely card design with the feathers. Wow! Beautiful card! Love the new marker refills. They are so versatile! 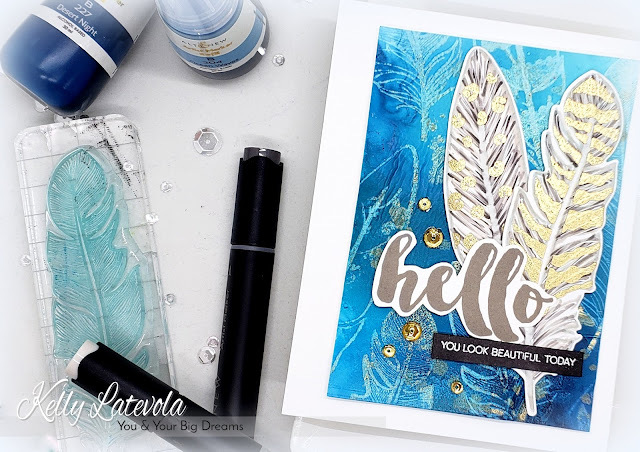 luv the muted background feathers with the striking detailed feathers on op!